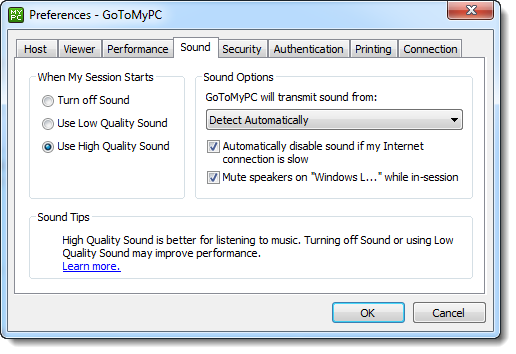 GoToMyPC supports one-way sound from your host PC to your client PC. The Sound preferences optimize your session for system sounds or music depending on your sound card, personal preferences and the speed of your network connection. Turn off Sound: Disables any sounds form your host PC to optimize performance. Use Low Quality Sound: Reduces the sound quality for better performance. Use High Quality Sound: Optimizes the sound quality. Select this option if you intend to listen to music from your host PC. GoToMyPC will transmit sound from: Enables you to select your preferred audio source or let GoToMyPC detect the source automatically. Automatically disable sound if my Internet connection is slow: Turns off all sounds from the host PC if a slow network connection is detected. If the network performance improves, you will need to manually enable the Sound feature. Mute speakers while in-session: Disables your host PC's speakers.Leave this option checked for in-session privacy. 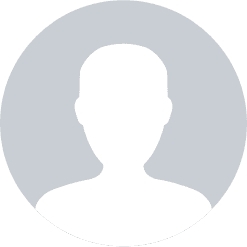 Note: If you are listening to music from your host PC, be sure to stop the music before disconnecting your session. After disconnection, the music will no longer be muted and could be heard by anyone close to your host PC.